Erin Fitzpatrick with UNOH leads a discussion on healthy and unhealthy relationships. 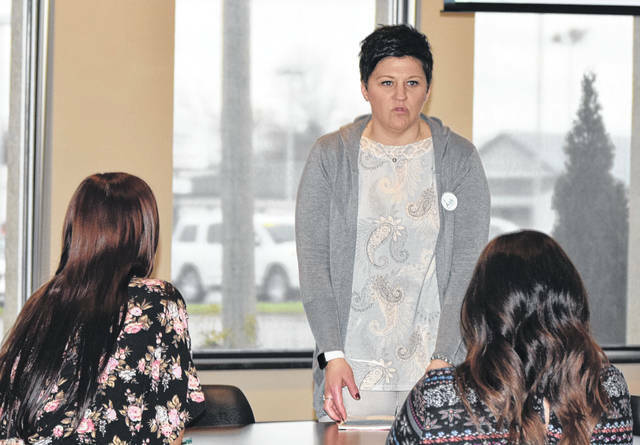 LIMA — April is Sexual Assault Awareness Month and the University of Northwestern Ohio’s Counseling Center and Title IX Office have partnered to create a month full of education and interactive ways to address sexual violence. Monday was the first day of spring quarter and students and staff were given the chance to learn more about healthy and unhealthy relationships through the One Love training at the Racers Station. Fitzpatrick led a workshop which included a 45-minute video about Yeardley Love, a woman who was murdered by a boyfriend in 2010. “(Her parents) wanted to find a way to teach other kids how to recognize some of the signs within their friend groups. If they see something strange happening with their friends to say something and try and find a way to help or let them know it’s okay to talk to people,” said Fitzpatrick. “It’s a good mantra to have when you’re dating. Anytime you want to attempt something with a partner somewhere it’s always important to make sure you ask if they’re ok with it first … to get that verbal consent and know that consent can stop anywhere,” said Fitzpatrick. Other events going on to mark Sexual Assault Awareness Month include a Digital Consent Booth on April 17 at the 13000 building where students can learn about the importance of asking for consent in online interactions. April 22 to 26: UNOH faculty and staff can pay $5 to wear jeans each day or $20 for the whole week. 5 p.m. April 29: “I Ask” Teal Color 3k and 5k run/walk. There is a $5 registration fee for UNOH students, and a $10 fee for the public. Proceeds from the color run and jeans day go to help sexual assault survivors including Crime Victim Services, Mercy Health-St. Rita’s and Lima Memorial Health System.